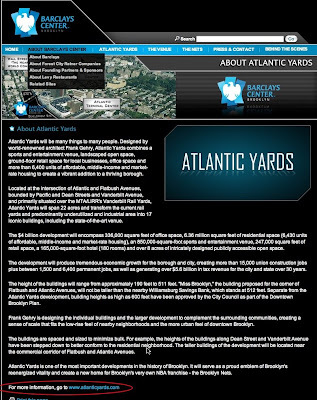 You can't get to AtlanticYards.com any more, because the web site now resolves to the official Barclays Center site. I think AtlanticYards.com is more likely suspended (pending major modifications) than dead (as per DDDB, which noticed first), but it sure suggests that the arena is the developer's priority, not the housing, open space, or other promised benefits that seem ever more attenuated. Here are some screenshots of the now-hidden AY site. And the designers of the Barclays Center site didn't get the memo, because that site still sends visitors to AY and claims that Frank Gehry is designing the project (see below; click to enlarge).